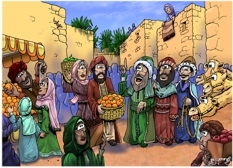 This scene is set in a market, in the city of Jerusalem. The sun provides the main light source, coming from above the scene. The wise men* can be seen on the right of the picture, in green, red and blue robes. 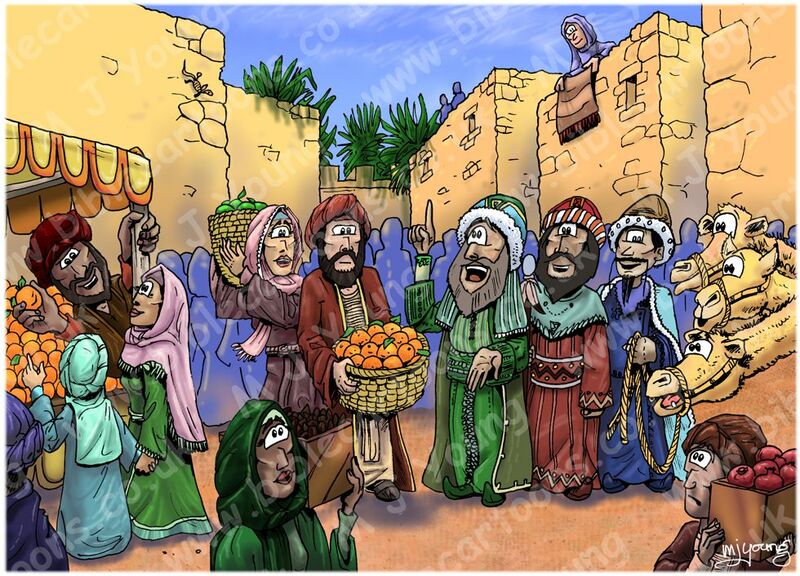 The wise man in green is pointing to the sky, and telling the market trader he is talking to about the star that they have been following from the east into Jerusalem. The wise man in blue can be seen holding the reins of their camels. Various market traders & customers. Three wise men? * Although the Bible doesn’t specify that there were three wise men, some Bible scholars have reasoned that the three gifts (gold, frankincense and myrrh) might indicate three wise men. 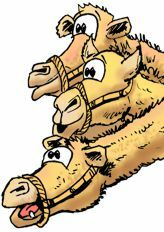 I have illustrated the scene with three wise men, or Magi, as they are also called. The design for the wise men’s features, robes and colour schemes was established in the Matthew 02 – The Nativity – Scene 07 – Herod & 3 wise men cartoon, created in Dec 2009. I made the background people simple blue/purple outlines, to keep the viewers focus on the wise men and foreground action.